Tomorrow, June 5th at about 3pm my baby girl Gabi turns 1 year old! 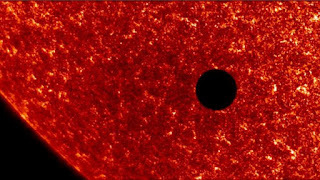 To celebrate this momentous occasion Venus decided to make a transit across the sun! Awe, thanks Venus, that was very thoughtful of you. 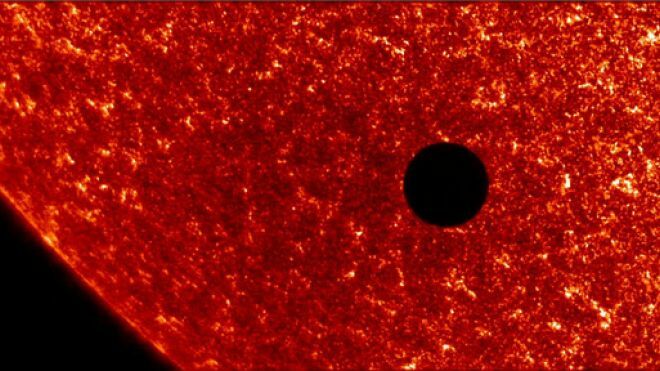 Transits of Venus are a rare astrological event in which the Venus passes between the Sun and the Earth. During the transit, Venus looks a bit like Cindy Crawford's beauty mark as it glides across the face of the sun. The event is predictable and comes in pairs that are roughly eight years apart, then not again for more than a hundred years. The next transit will occur December 2117. This event has been setting scientists atwitter since the 17th century, but it was Edmond Halley (of the so named comet) that recognized that the principle of parallax could be used to calculate the distance of the Earth from the Sun and from that work out the distances to all the other bodies in the solar system. However, Halley knew that the next transit wouldn't occur during his lifetime, long though it was. He therefore passed the slide rule to the next generation of scientists. And boy were they ready. In 1761 scientists from all over Europe were dispatched to over a hundred locations all over the world. As Bill Bryson states "It would be history's first cooperative international scientific venture, and almost everywhere it ran into problems." So much so that what data they did receive from the scientists that were lucky enough to avoid the hostile natives, equipment failure, cloud cover, sicknesses, war, even shipwrecks, was so filled with irreconcilable inconsistencies that the project ultimately failed. It wasn't until the second transit in 1769 when Captain James Cook took the necessary measurements while in Tahiti, presumably from a folding lawn chair next to a bucket of Corona. After popping over to Australia to chart it and claim it for the British crown, he returned and delivered his measurements to Joseph Lalande, who was able to calculate Earth's distance from the sun to be 150 million kilometers. Which turned out to be stunningly accurate for the technology of the time. Using modern methods we now know the precise distance to be 149.597870691 million kilometers. Much of my information came from Bill Bryson's book, "A Short History of Nearly Everything". Serendipitously, I'm currently reading tipped me off to the event happening this year so imagine my surprise when looking it up that it was to occur on Gabi's first birthday. Kinda cool.